Earlier this month I was sent Pieminister’s new limited edition Merry Berry and Mistlemoo pies to try. 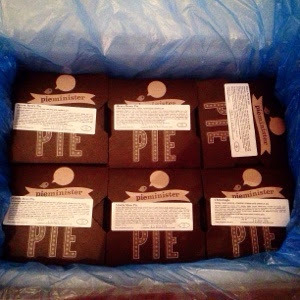 Promising to please the hordes of hungry house-guests you receive over the Christmas period, these pies has a lot to stand up to. Mistlemoo is made with British beef and free range British prosciutto with Aged Long Clawson Stilton and chestnuts in a rich red wine and port sauce. My boyfriend tried this pie and wasn't too keen on the sweetness of the red wine and port sauce. Containing a strong kick of Stilton it would be well balanced with a splash of gravy and heap of mustard mash. Merry Berry is made with free range British turkey and bacon with roast parsnips, sherry, red wine and cranberries. Although I wouldn't serve it as an alternative to the traditional ‘Christmas roast’, my brother, who tried the pie, seemed to enjoy it. Full of flavour, he was pleasantly surprised it contained a rich gravy instead of a white sauce. Christingle is a Vegetarian Society Approved pie made with Cheddar cheese and honey-roast parsnips with leeks and chestnuts. I thoroughly enjoy vegetarian food, so was excited to try this. Having arrived home one night after work, I popped it in the oven with high hopes. Unfortunately I found the contents rather dry and was left disappointed (and hungry). Deer Santa is made with British venison cooked in red wine with free range British bacon and puy lentils. This pie was our absolute favourite and hands down winner. 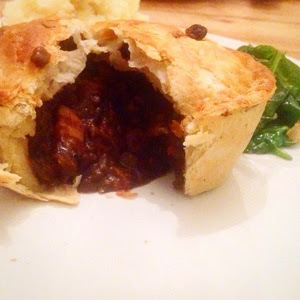 It features everything a good pie should: rich sauce, thin and crisp pastry and packed full of meat.